For the sauce: Put avocado, mayo, lime juice, salt and sugar into a food processor and blend. Add milk and blend until smooth. Put in a bowl, cover and chill. For the crab cakes: Stir together crabmeat, mayo, chives, lemon juice, mustard, pepper, and 1 tbsp panko in a large bowl until well blended. Cover and put in the refrigerator to chill. In the meantime, melt butter in a medium nonstick skillet over medium high heat, then add smashed garlic. Cook until golden and fragrant (about 2 minutes). Add Herbs de Provence, salt and remaining panko and cook stirring until golden brown, about 6 minutes. Transfer to a plate to cool. Discard garlic. Divide crab meat into mounds (I was able to make 8 medium sized mounds). Form each mound into a patty and then carefully turn patty in panko mixture to coat the top and bottom. 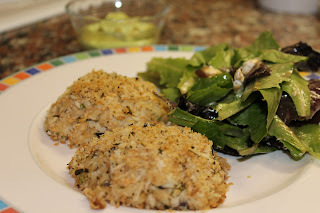 Transfer to a baking sheet and repeat with each patty, then sprinkle remaining panko mixture on top of the crab cakes. Bake until heated through, about 20 to 25 minutes. Let cool and serve crab cakes with a dollop of avocado sauce. Enjoy!